Several excellent adult Baltimore Catechism books any one of which will teach the Catholic faith well. Is there such a thing? Yes, there is an adult Baltimore Catechism. Oh, how I wish I would have known this when I was young and trying to learn more about the Catholic Faith! Do you need to read all of them? I think you can read just one. As time goes, I'm sure you'll want to read many more. For now, reading any one of the books on this page is the easiest way for you to learn the most about the Catholic Faith all in one book. That's what a catechism is, a catalog of the main Catholic beliefs. 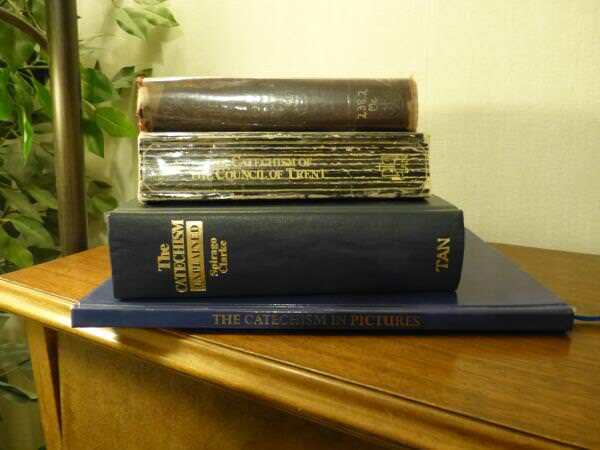 In general a catechism has two formats. If these are what you seek, choose between these two books. If you want a question and answer format use The Catechism Explained. If you like the story format, stay with The Catechism of Trent (CCT). Both books are old books, early 1900s, republished by TAN Books and Publishers. They each have their own information, so you could read both; yet reading one of them will be as much as you will probably ever need in life. The best adult Baltimore Catechism is The Catechism Explained. It is greatly expanded from the BC No. 3 with stories from the Bible and the lives of the saints. The Baltimore originated from The Catechism of the Council of Trent (CCT). Picture the truths of the Faith with this treasure: Catechism in Pictures. 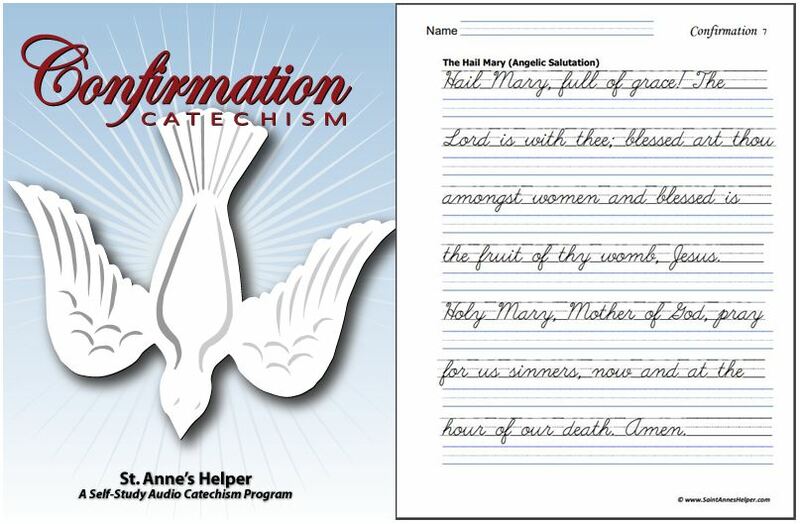 Adult Baltimore Catechism audio CDs and downloads. If you're dare not slog through many books looking for definitive statements of the Catholic Faith, you'll find that the best adult Baltimore Catechism is The Catechism Explained, by Rev. Frs. Spirago and Clark. The Catechism Explained teaches the beliefs of the Roman Catholic Church with the academic depth necessary for both high school students and adults. 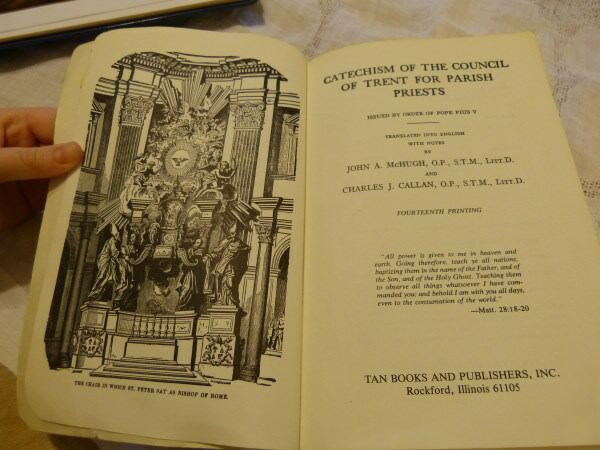 It explains the questions and answers in the Baltimore Catechism which originally taught the truths that the Council of Trent found necessary. In a way there are many publications for adults that are based on the Baltimore, yet if you have the Catechism Explained, a sort of Baltimore Catechism No. 4, you won't need to buy the other three Baltimore Catechisms. The Baltimore was called the "authoritative" catechism of the Council of Trent and fills a more encyclopedic role, too. 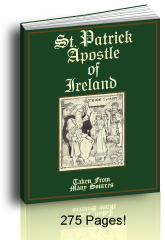 It is a super well indexed reference book for this time period and includes Bible and saint references. The Baltimore Catechism is based on the Catechism of Trent (Pope Saint Pius V and Saint Charles Borromeo). At this time there was not an English translation of the CCT, so the Bishops in Baltimore produced their own in 1885. The Baltimore Catechism No. 0 is a subsection of the No. 1. The No. 1 is a subset of the Baltimore Catechism No. 2. If you own the second, you do not need to buy the other two - just mark which questions you need to learn. The No. 3 is a shortening of the Explanation of the Baltimore Catechism which was for teachers according to Rev. Thomas L. Kinkead who is the one who composed this adult Baltimore Catechism No. 3. The Explanation of the Baltimore Catechism is a different book from The Catechism Explained (Amazon) and is reported to have some difficulties. I think you'll be much happier with the Spirago-Clark version. 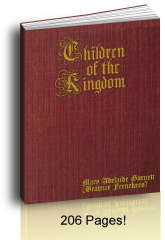 Originally the Baltimore was written to teach the truths of the Catechism of the Council of Trent (CCT) in question and answer format. Why? For a over one hundred years the CCT was not available in a good English translation. It was written in a prose or story-like format where a question and answer format was needed for teaching purposes. As a result, the Bishops in Baltimore commissioned their Baltimore Catechism, so named for their diocese. 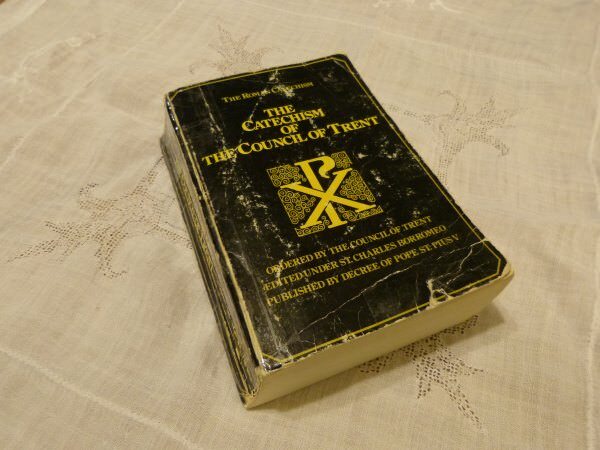 The Catechism of the Council of Trent has easy text that makes good reading. Be sure to get the McHugh and Callan edition as shown in the photo below. In order of time this book comes long before the Baltimore. Its foreword has an excellent history of its publication that is an education in itself and explains the reasons why the Baltimore was published - especially the reason that the CCT wasn't yet available to very many people in English. The Tan Books version has an excellent picture of the Chair of St. Peter that we did not see in other reprints. So far, we've seen three that seem to have no difference in their content other than this image of St. Peter's Chair. The Tan Books version of the Catechism of the Council of Trent has a plate, picture, of the Chair of St. Peter. This is the main difference I've seen. You can use the CCT in high school. It makes an excellent high school or adult catechism. Use it in a class room or read it in private study. It is an excellent introduction to the Catholic Faith for one who is new to the faith and it can replace an adult Baltimore Catechism if you do not need a rigorous formula of questions and answers for memorization or reference. On top of that, it is very easy to read and has great stories to explain concepts. Your younger children can understand most of it if you're reading it together as a family. I have used this book with four of our high school children and we are all glad that we have had this great opportunity. It was in large part compiled by St. Charles Borromeo and approved or promoted by Pope Saint Pius V. These two saints had a large part of the responsibility for this book which is reassuring to me. Think of it: A catechism written by saints! I love it. Most of the versions seem to be verbatim to each other. The only difference I could tell between several versions is that there is a wonderful image of the chair of St. Peter in the TAN version that is not in other versions of the CCT. In a way it is the "original" adult Baltimore Catechism and can be bought at Amazon. I share more about using the CCT in high school here. 3. 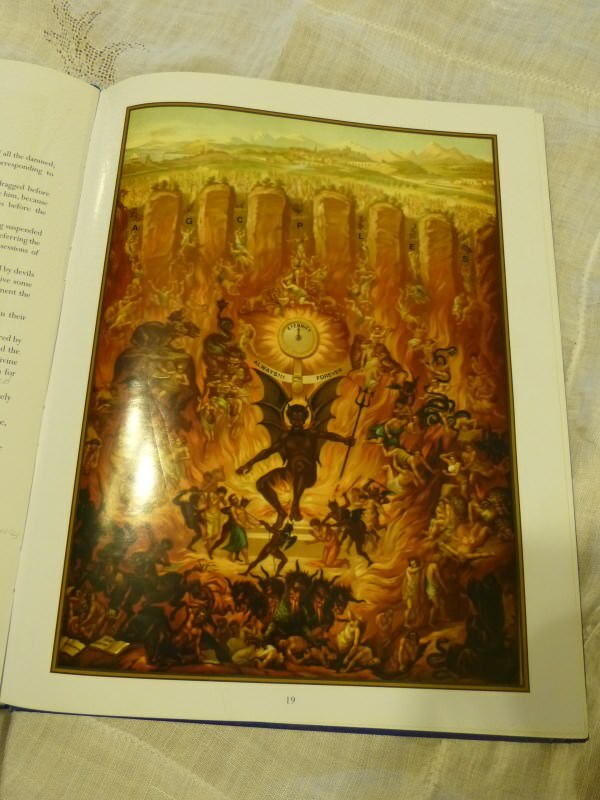 The Catechism in Pictures - Beautiful! 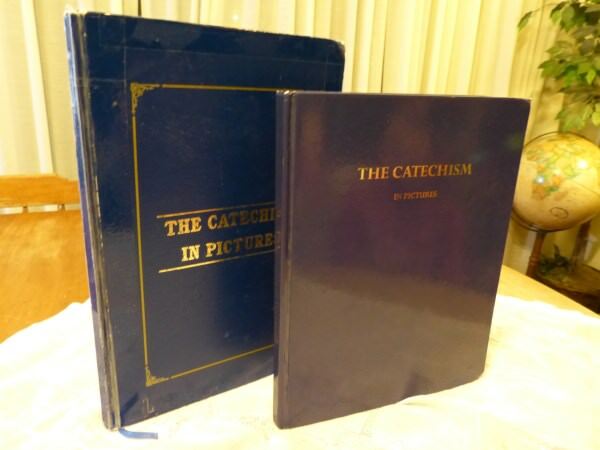 Old and new versions of the Catechism in Pictures is in question and answer format like an adult Baltimore Catechism, yet the pictures make it great for children. Buy The Catechism In Pictures at Amazon. A third recommendation you'll love and is like an adult Baltimore Catechism is The Catechism in Pictures (buy it at Amazon). It brings the Bible and saints to life while simply answering the catechism questions with beautiful paintings. It is a beautiful presentation of the Catholic Faith with the most interesting and artful full page plates that each explain the article of Faith being taught on the opposite page of text. At a glance you'll find its a real short cut to understanding the Faith. This is an awesome book to share with children and teaches the faith well enough for adult catechumens (those learning the truths of the faith for the first time). If you're learning the truths of the Faith with your children, they'll love it when you share this book with them snuggled up on the couch. The pictures alone teach the Catholic Faith better than most Catholic books! I know families whose copies are quite ragged with use because the details in the pictures are so interesting. It's a great book to leave on the coffee table as your children will pick it up to look at it. 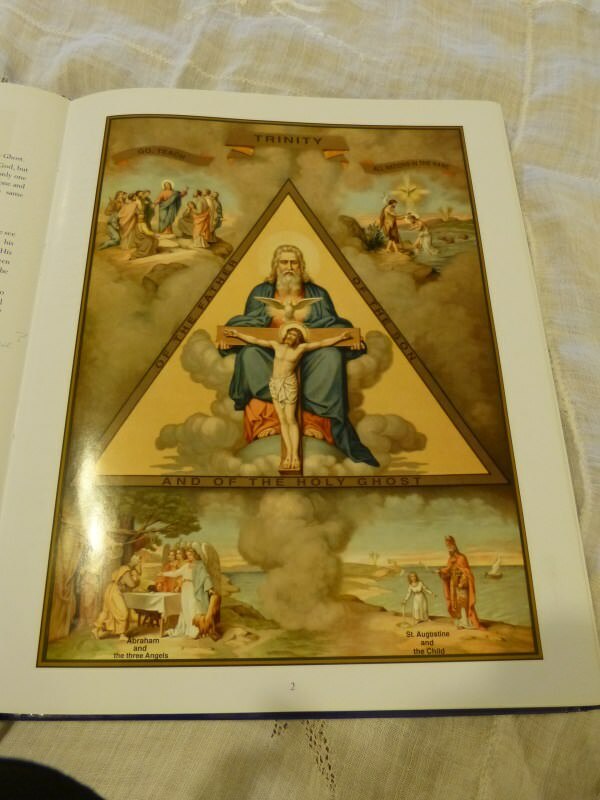 The Catechism In Pictures: Plate on the Blessed Trinity. To save space the publisher left off the questions in the English translation which we think is a very good idea since the text is large enough to be easily legible yet is the right size to fit next to the appropriate picture. It is in a very concise format and is a brief summary of the same information in an adult Baltimore Catechism, Cliffs Notes style. Most of the changes have been removals of words as with the condemnation of Freemasonry. It also uses different names for some of the Books in the Bible. One or two lines are very badly put. The colors in the pictures have been enhanced from the older versions and the pictures have been edited to change the original French to English. The frames to the pictures have been trimmed, too, removing the date from one of the original end plates. The Catechism In Pictures (69 Large Full Color Classic Pictures - see the preview photos) even more precise especially when teaching children! The pictures alone teach the Faith better than most catechisms. Update 2011: It is blue with gold edging and has some edits, but it still has the same glorious pictures that are now color enhanced. You can buy The Catechism In Pictures at Amazon. Since 2016 there is yet another version that has a maroon cover with a picture of Jesus on the cover that is essentially the same as the previous revision with the shiny pages. Beware the changes. The Baltimore Catechism teaches that there is a Hell and we must avoid going there. For children though, the pictures alone teach the Catholic Faith better than most catechisms. Leave this book for the children to study, and give them time to marvel at the explanations of the pictures which is usually one-fourth to one-half the lesson. There are 69 lessons that will teach the whole family the basics about the Ten Commandments, the Apostles Creed, the sacraments, and the virtues. The pictures make this a wonderful book for children and adults! You can sometimes buy The Catechism In Pictures at Amazon as they only publish it in small batches, which also means that there might also be constantly different editions. We now own three different versions. Get the oldest version you can find. These CDs are like Cliff notes to the Baltimore Catechism. 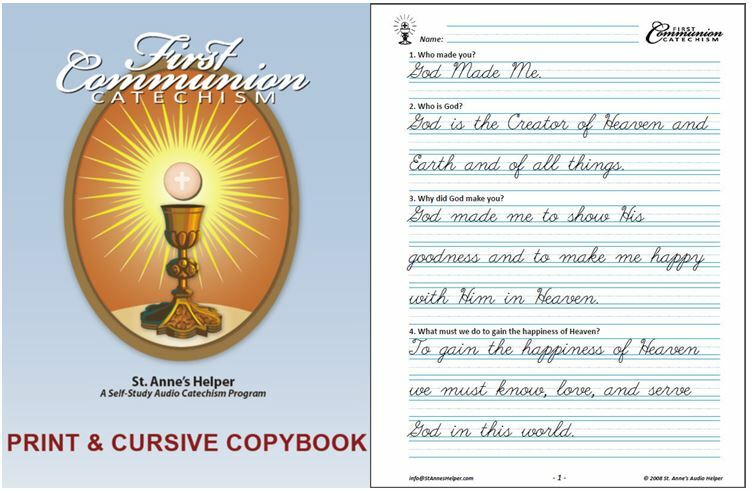 If you're looking for a short cut to learning the basic adult Baltimore Catechism answers you'll find them on our St. Anne's Audio Catechism CDs with each question and its answer on its own track. This makes it easy to find a particular track, for example: memorizing the Catholic Ten Commandments, Catholic Holy Days of Obligation, and the Catholic Our Father prayer and the Prayers of the Rosary like The Apostle's Creed. Preparing to be Baptized and receive the Holy Eucharist? Volume One teaches the basics necessary for one's first reception of the sacraments of Penance and the Holy Eucharist. This volume gives an introduction to the first three Catholic sacraments that Catholics usually receive: Baptism, Penance, and Holy Eucharist. Volume Two teaches the basics necessary for a preparation for Confirmation. This volume gives the basics necessary for all seven sacraments with an emphasis on Catholic Confirmation and the truths of the Blessed Trinity. Both use the Baltimore question and answer format with the exact wording from the Baltimore Catechism No. 2. You only need one to start. In conclusion, an adult Baltimore Catechism, or any catechism for that matter, by definition, IS a question and answer book that teaches the basic Catholic beliefs. It is also a very handy format for being able to look up an answer after the catechumenate days of study are finished. The Catechism Explained (Amazon) seems to be the best adult Baltimore Catechism since it gives fuller answers that follow the idea to larger conclusions. For example: Which Commandments does the practice of Socialism break? See the explanations under the Seventh and Tenth Commandments. If you are looking for a cozier book to read, you'll really enjoy The Catechism of the Catechism of Trent (Amazon). The Catechism in Pictures (Amazon) has wonderful pictures. Then, learn about the lives of the saints. If you're looking for a refresher listen to the First Communion and Confirmation catechism (about 25 minutes each). List of the main Catholic beliefs.